Well, folks, it's a done deal. I am willing to sell my soul for anything and everything that Alyssa Cole writes. After adoring the first book in this series, A Princess In Theory, I knew this companion novel was going to be a hit for me. I mean, just look at the two beautiful people on that cover! Do they not give you shippy feels that you want to drown in??? I am beyond thrilled to say that the inside of A Duke by Default was even more glorious than the outside. I know I am notorious for always pushing books on you guys, but friends, when I say ALL of you need this book in your life, I truly do mean it. I could write an entire essay on said grump. You all know how much I love my heroes stoic, grumpy, but secretly soft. Tavish hit all those marks for me. I'll say that Tavish was very rude to Portia when they first met as she wasn't exactly what he was expecting his apprentice to be - she's fashionable, American and gorgeous. What would she even want to work at an armory??? Boyfriend here was completely unaware of just how smart, talented and devoted Portia could be. Thankfully, Tavish was also a guy who knew how to apologize and I swear, every time he apologized to her or thanked her for boosting his armory business my heart would just swell in happiness. I had so much love for this guy and this love only grew throughout A Duke by Default. As with Portia, Tavish also made quite a few discoveries about himself and his heritage that put him in the limelight because of Portia's meddling. I was worried for a minute about how he would react angrily, but I was pleasantly surprised. Tavish was a stand-up guy and ugh, where can I find one in real life, Ms. Cole? The romance between the two was soooooooo good. Just the thought of them makes my heart ache - you know that's a sign of an epic memorable romance. They initially wanted nothing to do with each other and there was a bit of animosity between them as a result of Tavish's rudeness, but the CHEMISTRY. OOOOOOF. I nearly died of all the swoon-worthy moments between them. When they finally gave in to their attraction, it was truly worth it. Their romance was definitely slow-built and while I devoured all the romantic butterfly-in-the-stomach inducing moments, my favorite thing about these two was how they pushed each other to be better. They were a beautiful and complementary couple in every way. Besides the romance, I loved all the secondary characters, including Tavish's brother and sister-in-law - they were a fun addition to the story. Portia, her friend and newly-minted Princess Naledi, and Naledi's cousin were all part of this group chat that we are allowed to take a look at and OMG. It was one of my favorite parts of A Duke by Default and had me cracking up. They truly made for an awesome girl group and I couldn't get enough. We also meet the hero of the next book, and boy is he going to be a treat! 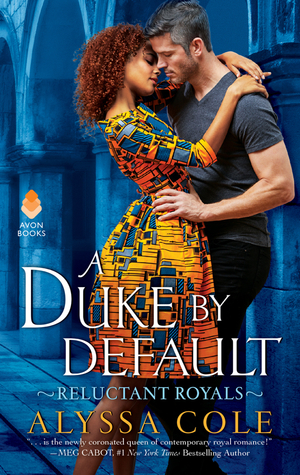 I think I've rambled sufficiently about how much I loved A Duke by Default. I hope I've managed to convince everyone to read this one. It's honestly one of the purest books I have ever read. I will most definitely be re-reading this one soon! What is your favorite hero trope? Have you read books by Alyssa Cole?